Gajic stated that he arrived in Canberra on November 10, to make police believe he came to Canberra to kill the prime minister, in the hope that he would be sent back to Yugoslavia. He was found to be in possession of a cut-down .22 calibre rifle and magazines containing up to 100 rounds of ammunition, along with a photo taken from a newspaper of Prime Minister Holt. After two trials in December 1966 and March 1967, where juries failed to reach a verdict, the Crown decided not prosecute charges against Gajic any further. Holt commented, ‘The decision not to go ahead with the third trial…was convincing evidence of the strength of democracy in Australia.’ There were some accounts that a single shot was fired at the building, cracking a window, while Holt was working. This is not supported by any of the newspaper reports of the incident. 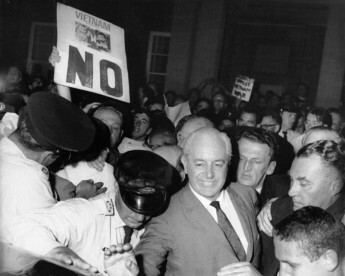 Harold Holt jostled during a November 1966 election rally in Rockdale. NAA: M4294, 7. David Jolliffe joined the Australian Prime Ministers Centre as Assistant Manager in 2007. He previously worked at the Australian War Memorial and the National Archives of Australia and likes assisting people to learn more about Australian Prime Ministers and political history.